Tips And Tricks That Can Make You A Facebook Pro:- Have you been using Facebook for such a long time that you now think you know all its tricks and tips? Well, you are in for a treat. What if I tell you that there are still a lot of things on Facebook that you have no idea about? let’s not get into an argument. Dive into the article to find out the 7 tips and tricks that can make you a Facebook Pro. Suppose it is of the form https://www.facebook.com/xxxxxx . Replace www. by m. That is to https://m.facebook.com/xxxxxx . This converts the page to the mobile version. 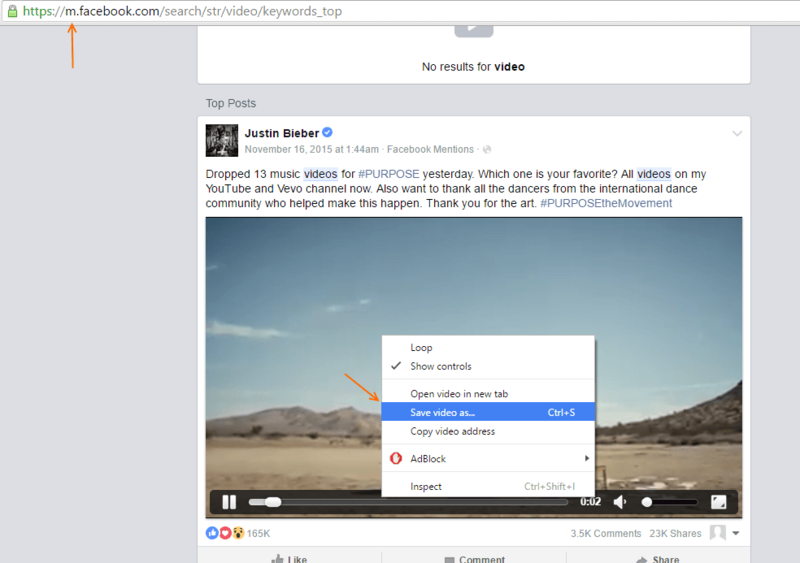 Now, Play the video and do a right click on the video being played to save it on your PC. You find this super cute post about motherhood on Facebook, but it’s too lengthy and you don’t have the time to read it at the moment. If you do nothing about this, you might never be able to find that same post on Facebook ever again. Don’t worry, we have got the Save Post option tailor made for you. To save a post to read later, click on the drop down arrow associated with the post and then click on Save link or Save post option. You can view the saved posts later in the Saved folder which is located in the left pane of your Facebook window. Facebook has this amazing feature by the name On This Day. Using On This Day feature, you can view what happened on this particular day a year or two back. That is, today is the 31st of March, 2016. 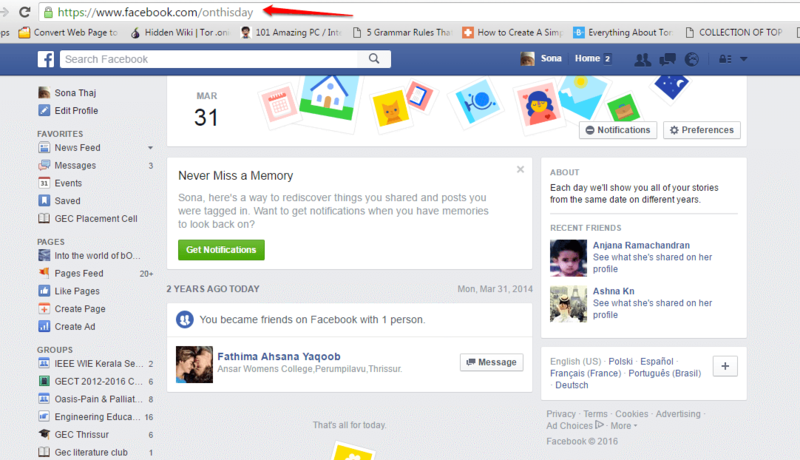 If you click on the On This Day feature, you will be able to view what all things happened on your Facebook account on the 31st of March 2015, 2014, 2013 and so on. To get to the On This Day page, log in to your Facebook account and then click on this link. 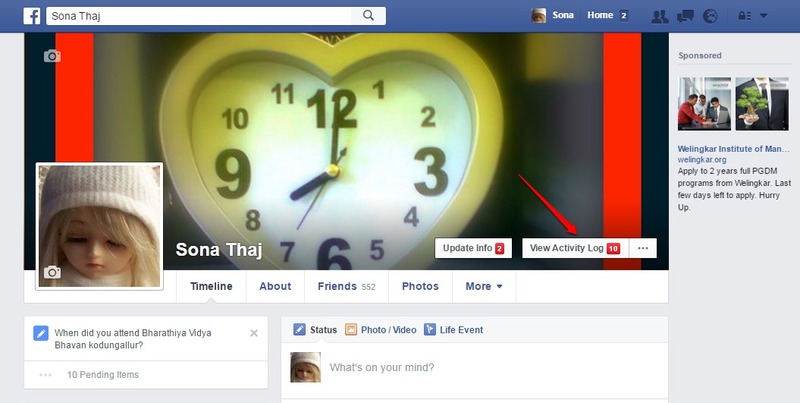 You can keep track of your Facebook activities by making use of the Activity Log feature. You can use the Activity Log even to find out whether any unwanted actions have been made using your account. Find View Activity Log button by visiting your profile. 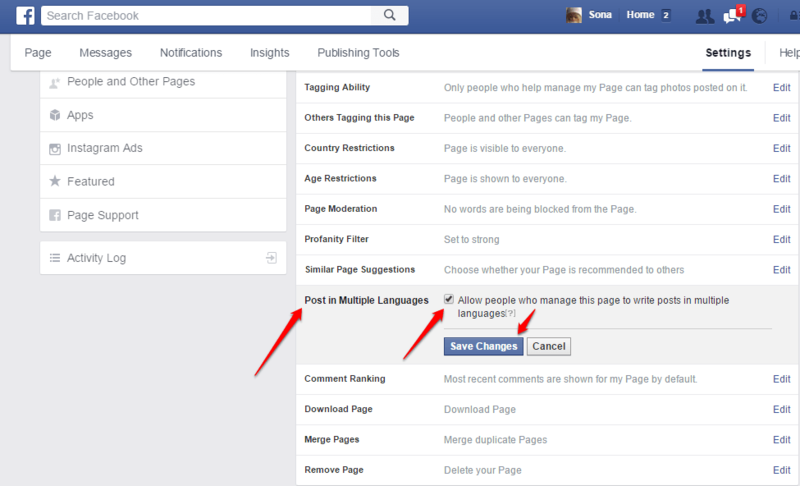 If you are the admin of a Facebook page, you can now post in multiple languages. For that, go to your page, and click on the Settings tab as shown in the screenshot given below. When the General Settings opens up, you have to scroll down and check the checkbox corresponding to Post in Multiple Languages to enable this feature. Now the viewers will be able to view the post in multiple languages. To view your profile as someone else, go to your profile and then click on the 3 dotted icons right next to the View Activity Log button. From the drop-down menu, click on View As option as shown in the screenshot. 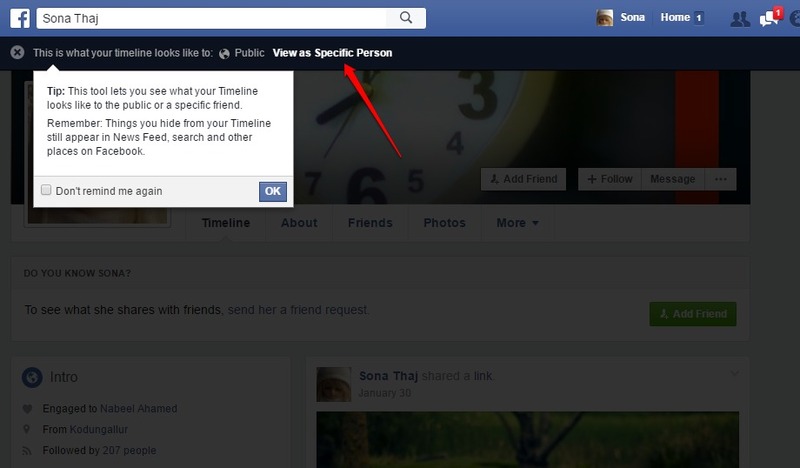 You can now specify the person as whom you want to view your profile as. To make your posts visible to only a particular set of people, type in your status and click on the Friends button at the bottom. 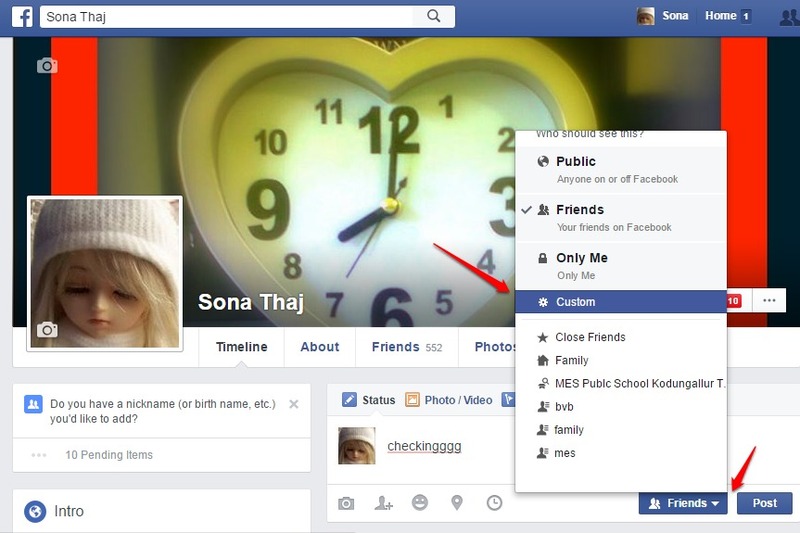 Now from the drop-down list, you can customize the set of people whom you want to share your post with. You can get notifications from a particular friend such that whenever they make an update, you get notified. 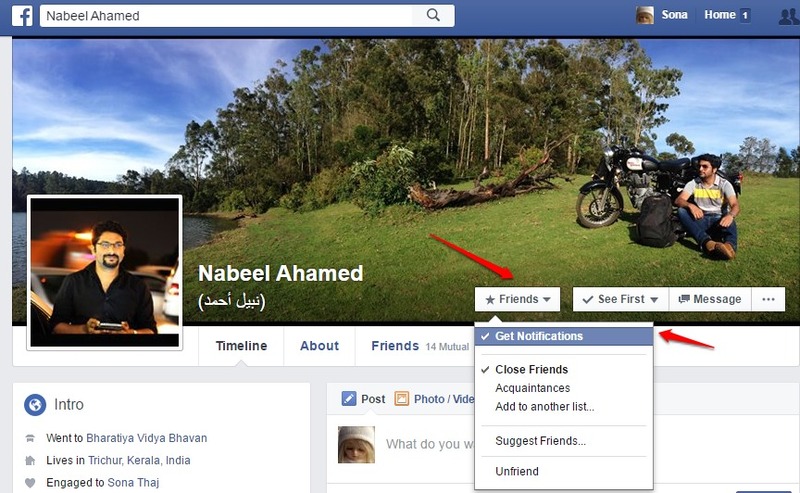 To activate this feature, visit the friend’s profile whom you want to spy on, and click on the Friends drop down arrow. Now click on Get Notifications options as shown in the screenshot. And now you know something! Do share the article with your friends. Hope you found the article useful. Go to settings -> Security and End all activity as shown in pic below. Do you know, facebook has a secret inbox, which is filled with messages from the strangers and you haven’t been notified about it ever. Just go to Messages -> Message requests -> Filtered requests .Here is how to see facebook secret inbox. Do you know for a thumbs up you just need to type (y) and the thumbs up will be pasted in facebook. Belown are the list of famous secret facebook emojis you do not know. This is anot a useful feature, but do you know you can see whole facebook in upside down texts. You can just prank your friend by changing this one setting, and he will go nuts. Just go to settings -> Language and change what language do you want to use facebook by clicking the edit button and choosing facebook ( upside down) from the dropdown. 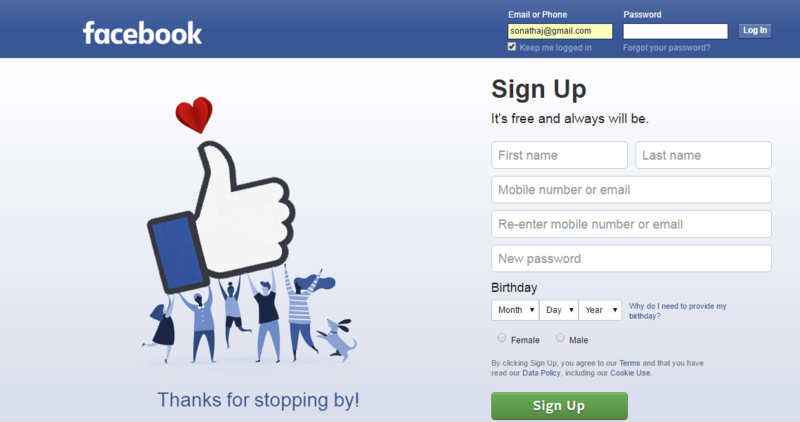 Just go to https://www.facebook.com/notes and write a customized and editable long article like post.